Off California’s Pacific Coast Highway in Northern California is the coastal city Half Moon Bay. 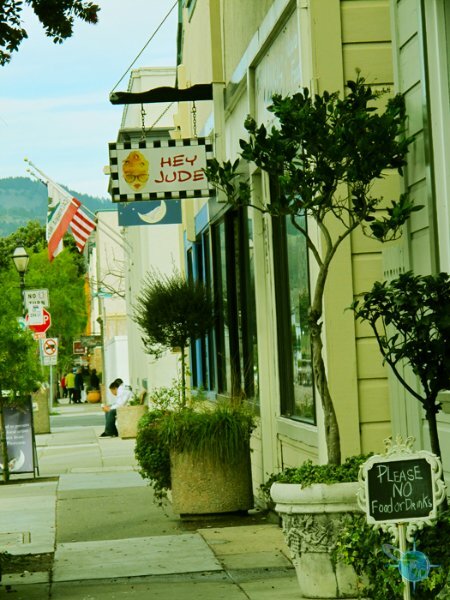 Half Moon Bay’s historic Main Street is filled with original buildings that have been modified to be new treasures. The sidewalks and streets are clean and smoothly paved. Trees and flowers pots align the walkways and shop doors are usually left open. 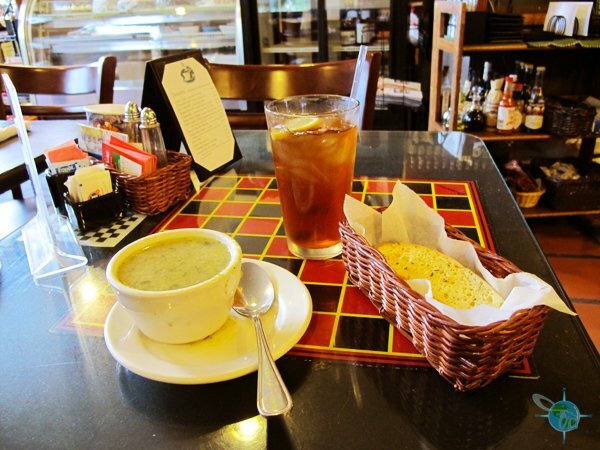 A local book store, cafes, and even a physic reader can be found somewhere on Main Street. 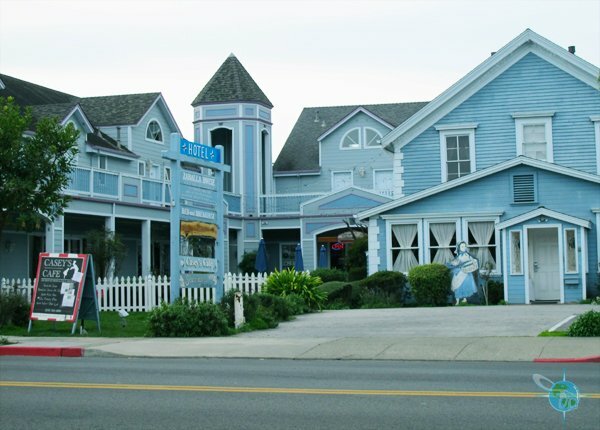 A variety of restaurants are on Main Street as well and on the adjacent streets too, everything from sushi to organic to bar food. The main attraction is shopping so expect to see all kinds of stores. One store that I found particularly charming was this card shop called the Paper Crane. They have all different kinds of cards to choose from as well as other home items. 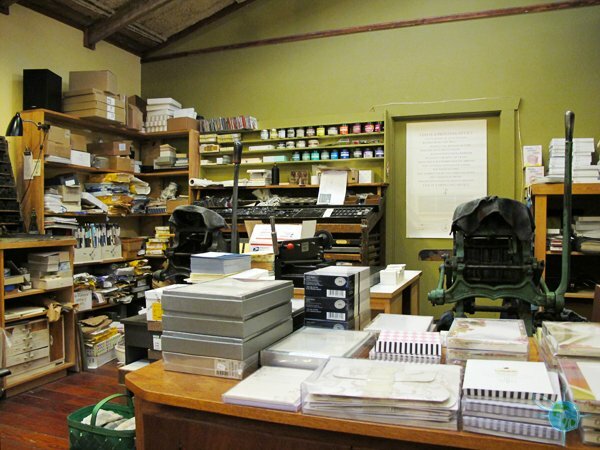 What I loved was the printing press kept in the back that was still in full operation. I ended up buying two cards made by the grandson of the owner made with this press. There is a large selection of antique-type store but the one I found that stood out in the crowd was Got to Have It. 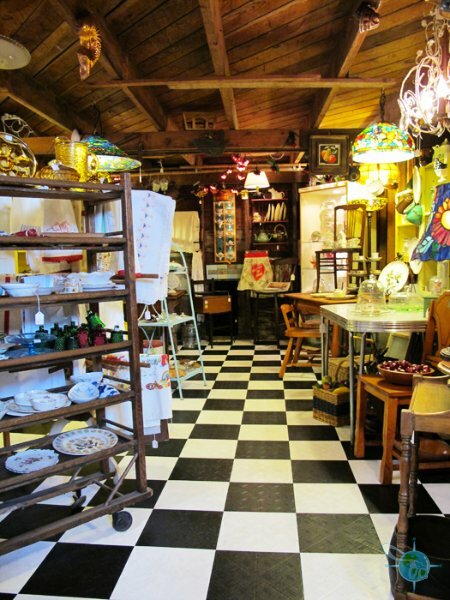 The large yard and refurbished barn is covered in displays of antique and collector items. Some areas got a little tight but all and all there was enough room to meander through all the stuff. 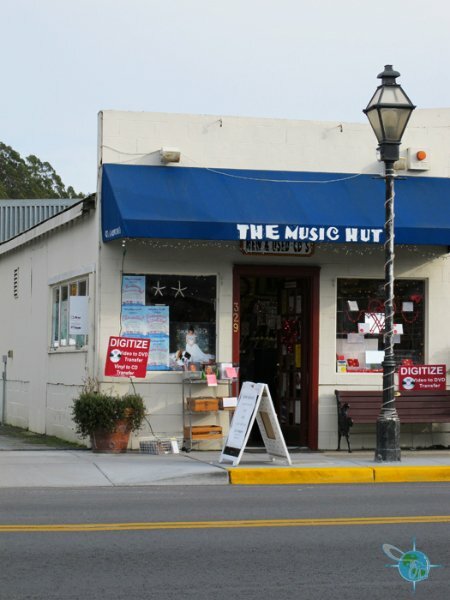 Another shop that made an impression was Music on Main Street, one tiny music store still in existence. 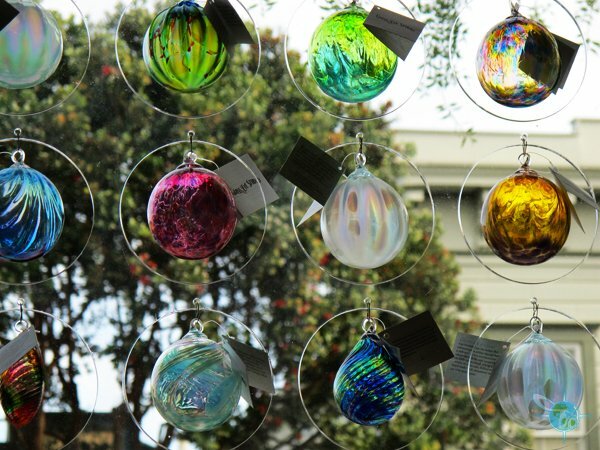 Art Galleries can be found right on Main Street and on adjacent streets. 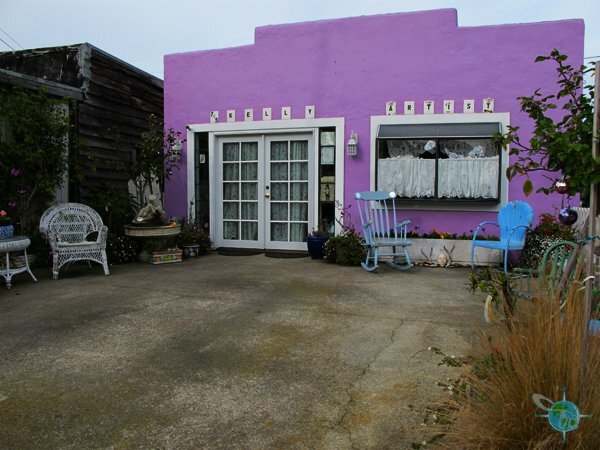 Usually the building entrance to the gallery looks like a business, like the Garden Gallery but just off Main Street there are some, as seen in the above left photo, that almost look like a house. Furthermore, not all galleries are wheelchair accessible as with the rest of the shops but most of them are. For example, you can roll right up from sidewalk level to the Kelly Gallery and do have ramps like the Garden Gallery. Every few hundred feet along Half Moon Bay is a new beach showcasing the beauty of the California shoreline. 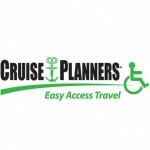 What is particularly wonderful about this area for a wheelchair traveler is the Coastside Trail, a 3 to 4 mile paved pathway from Half Moon Bay State Park to the town of Montara. The trail is almost entirely flat but good exercise. Occasionally, there will be an “off road” dirt trail leading to a bench, picnic table, or just closer to the ocean cliff, which is recommended as long as your ability can handle it and you don’t mind getting a little dirty. 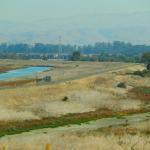 Along the Coastside Trail expect to see an array of bird wildlife, like hawks, and plant varietals. Most beaches have handicapped parking but some just have all general spaces. Only some beaches have accessible restrooms. Venice Beach is a couple miles down Highway 1 after making a right off the 95 Freeway. It has two or three parking lots so finding a disabled parking spot should be easy. What’s also nice about this beach is that there were accessible restrooms available in the parking lot as well as a couple along the trail heading towards the town of Montara. The trail itself is really flat, which is a ideal for most wheelchair travelers. However, there are occasional dips or slight inclines that will involve some muscle or a push from a friend. Making your way to the coastline from the parking lot at Venice Beach requires going over a wooden bridge. Many of the planks don’t line up and are uneven making it easy for a wheelchair user to get their front wheelchair wheels caught, so cross this bridge carefully. The visitor center at Francis Beach is wheelchair accessible. Francis Beach is also a campground and another point for wheelchair to access the Coastside Trail. 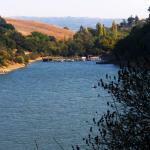 A few wheelchair accessible campsites with restrooms and shower facilities are available. 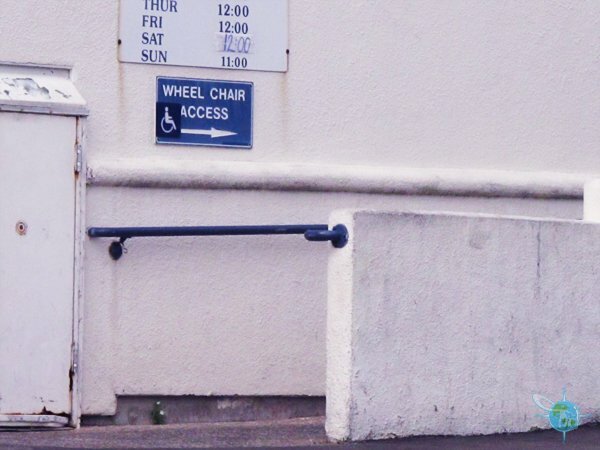 Furthermore, a beach wheelchair may be checked out at the front entrance at not cost. Parking in this area requires a fee. Poplar Beach is another starting point on the Coastside Trail for the the wheelchair traveler. The parking lot is dirt and unfortunately there are only a couple of handicapped parking spots, so you may need to park in the dirt but it’s packed real hard on a weekend or holiday; there is no parking fee. 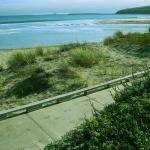 Similar to Venice Beach, Poplar Beach has a trail that hugs the shoreline so you can be to enjoy sweeping views. If you are looking at the ocean and head left on the trail you’ll eventually get to a grove of Lone Cypress that twist and stretch out to the Pacific Ocean. There are also lots of great open spaces where many people fly kites. However, this direction on the trail eventually turns into a packed dirt and has a number of uneven surfaces that you’ll have to be careful going over. This portion of the trail is not for the beginner wheelchair hiker. Heading in the other direction on the pathway at Poplar Beach is a longer paved trail and connects to Francis Beach. 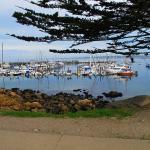 Pillar Point Harbor is a very popular place to bird watch along this part of the Coastside Trail. The wheelchair accessible part of the trail at this point is only about 0.5 miles but nonetheless worth getting out and looking around. In addition to bird watching, nearby is the famous Mavericks surfing point, a quaint beachfront town, and sometimes you can spot sea lions resting and playing on the shore. 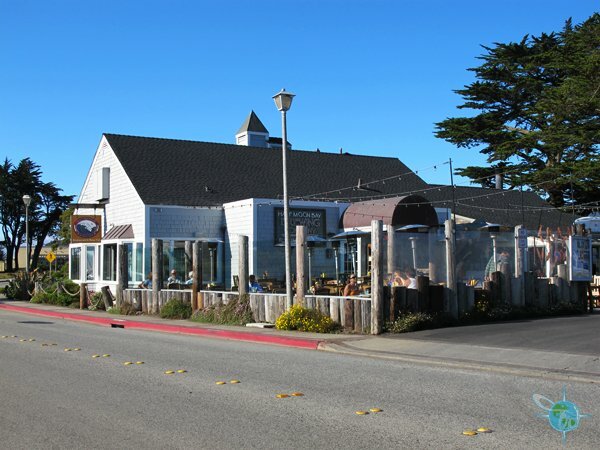 Half Moon Bay Brewing Company is a yummy suggestion for lunch or dinner. The outdoor patio is faces the bay and there is a lot of seating. One colder days the outdoor heaters a lit so one can still stay warm. Another way to keep toasty is by the fire pit, otherwise, you can choose from the ample selection of indoor seating. The menu is a little over priced but the food is tasty bar food. If you enjoy artichoke hearts then I highly recommend the fried artichoke hearts. Being a brewery, there is a good selection of beer. The Half Moon Bay Brewing Company aims to be “green friendly” and has a label on all their plastic cups saying that they were made from plants. A wheelchair accessible restroom is available inside. Moss Beach Distillery hangs on the cliffs in Half Moon Bay. The building itself is historic and is famously known for the blue lady ghost that makes frequent appearances (more info on site). There is a lovely outdoor patio but indoor seating as well. Moss Beach Distillery has a full bar with local hand-crafted beers along with an all-day, bar and Sunday brunch menu. Handicapped parking is available outside and wheelchair access to Moss Beach Distillery is possible via a ramp on the right side of the building.